ICERM, Brown University, USA. 4-8 April 2016. Organizers" D. Gaidashev (Uppsala), S.Galatolo (Pisa), S.Luzzatto (ICTP), W. Tucker (Uppsala), M. Yampolsky (Toronto). ICERM Special Semester "Dimension and Dynamics"
Organizers: S. Galatolo (Pisa, Italy), S. Luzzatto (ICTP). Organizers: A Agrachev (SISSA), A. Bufetov (Steklov Institute, Moscow), S. Luzzatto (ICTP), V. Timorin (Higher School of Economics, Moscow). 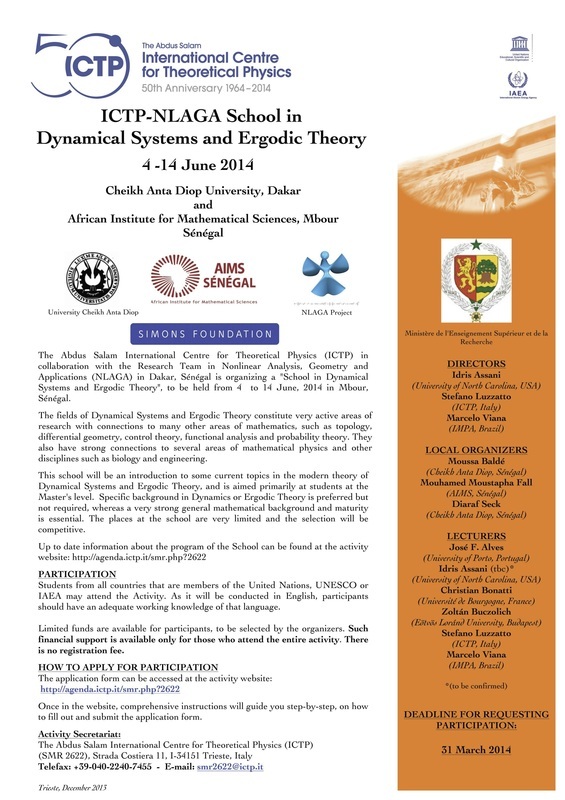 School and Workshop on Dynamical Systems. ICTP School and Conference on Computational Methods in Dynamics. Lecturers: M. Abate (Pisa), F. Aicardi (ICTP), S. Luzzatto (ICTP), J. Rodriguez-Hertz (Montevideo), I. Rios (UFF, Brazil). 13-18 July 2009, Imperial College London. Invited speakers: Alves, Abdenur, Abate, Berger, Burns, Freitas, Field, Jordan, Nicol, Rasmussen, Schmeling, Todd, Wang et al. Mini-Workshop on The Lorenz Equations. Geometry of Hénon-like and Lorenz-like maps. Organizers: S. Luzzatto (Warwick) and S. van Strien (Warwick).